Verbena is a perennial flower, but in colder climates it is more popularly planted as an annual in containers and landscaped beds. Six different cultivars and dozens of different types of verbena can be grown throughout the United States. Verbena blooms are quite small--usually just an inch or two--but the plants themselves can grow large, some between four and six feet wide. Blooms come in many colors, including red, pink, purple, white, orange and multicolored. Although verbena is a perennial, it will only come back year after year in warmer climates. In USDA hardiness zones 5 to 10, verbena can be planted as an annual. The plants prefer drier, desert-like climates and can be difficult to grow from seed in hot, humid conditions. At the height of summer in humid regions, the plants may stop blooming because the heat is too intense. Verbena needs to be grown in full sun, preferably a location that gets at least six hours of direct sunlight each day. As with most flowers, they need to be planted in a well-draining soil. The flowers will not grow to their potential in soil that is always moist or damp. 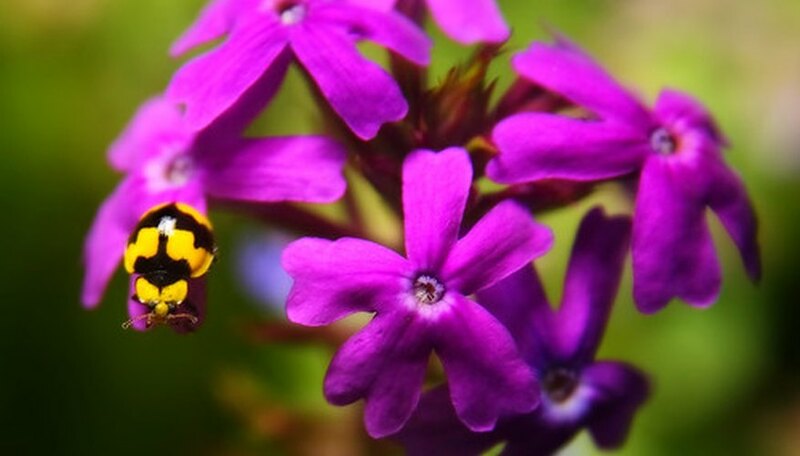 When to plant verbena depends on your location. If you will grow the flowers as an annual, they should be planted in late spring or early summer. As a perennial, they also should be planted in the spring, after the threat of frost has passed. When planting verbena, dig a hole large enough to accommodate the plant's roots. Place it in the hole and firmly repack the dirt around it. Be sure to thoroughly water it immediately after planting. It's also a good idea to pinch off the branches following planting to encourage more growth. If you are growing the plants from seeds, you can start them indoors about eight to 10 weeks before it will be warm enough to transplant them outdoors. Be sure to thoroughly water your verbena plants for a week or two after planting so they can begin to establish their roots. Over watering, though, can cause root rot. Fertilization is not necessary with verbena, but if you prefer to feed the plants use a 16-4-8 fertilizer. In areas where verbena are grown as perennials, trim the plants back at the end of each growing season and mulch over the plants before the start of winter.